Ixalan is a land of hidden wonders, dangerous wildlife, and swashbuckling adventure, and the art in the set brings this world to life on every card. So let's take a closer look at some of that art in larger-than-card size, along with the descriptions that led to the creation of each piece. 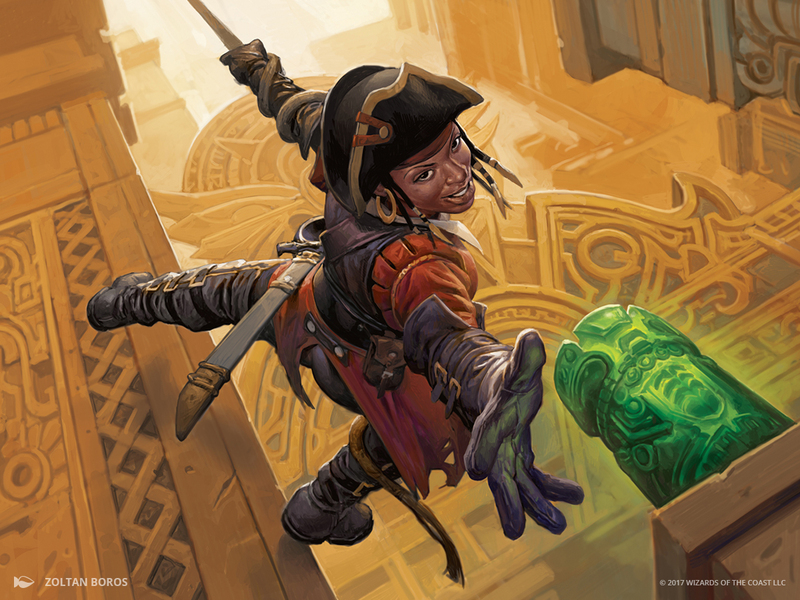 Action: Show a female pirate rogue swinging in on a rope/vine and grabbing the glowing totem off the pedestal (see above). This is an exhilarating moment and she's loving it. Action: We're looking out from inside the mouth of a massive T-rex–like dinosaur. 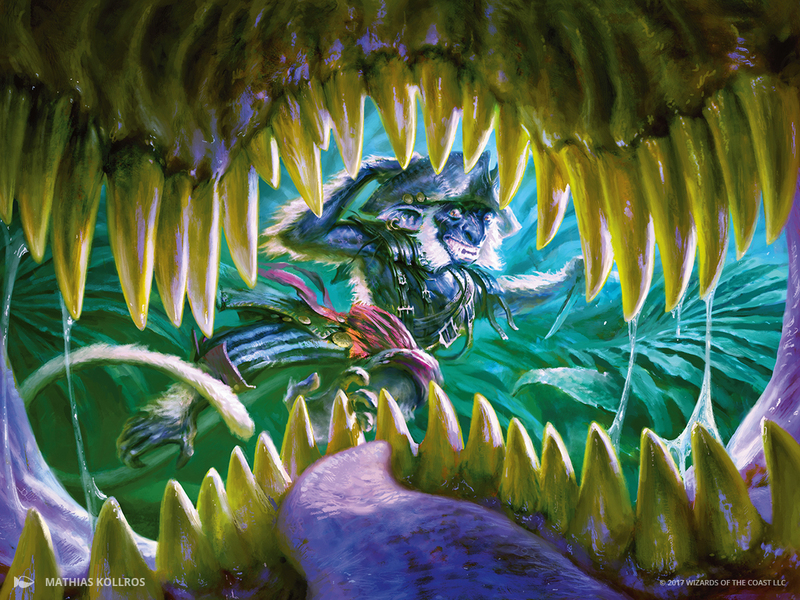 Through the razor-sharp teeth, we see the dinosaur's prey: a goblin pirate. The goblin is dashing away, looking back over his shoulder in terror as he desperately clutches his hat that's falling off. Mood: The hunt is on! Action: This is a malady that inflicts someone who steals a cursed treasure. Show a goblin who has been cursed with the "evil eye." Maybe he's hanging upside-down, leering at us with one crazed, feral-looking, blood shot, red-irised eye. 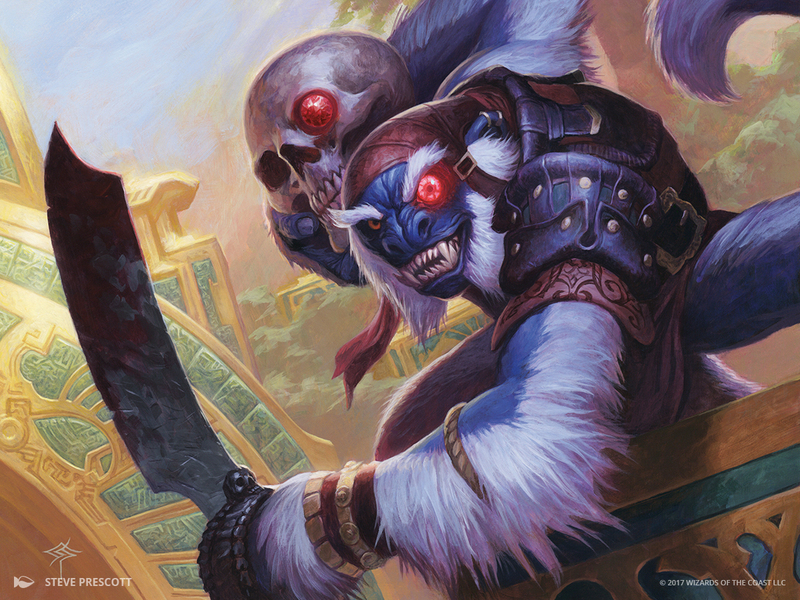 He slashes wildly at us with his sword while cradling the treasure he stole—a skull with one glowing ruby eye that matches his cursed eyeball.